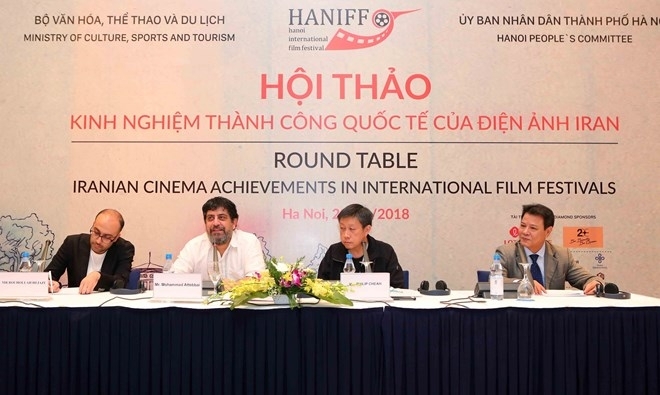 A seminar on Iranian cinema achievements in international film festivals took place in the Vietnamese capital city on October 29, as part of the fifth Hanoi International Film Festival (HANIFF). Iran is known for its successful low-budget films which have won more than 3,600 awards at different cinematic events worldwide since the 1979 revolution. The seminar was an opportunity for Vietnamese filmmakers to see how their Iranian peers sought out different approaches, ideas, and angles to overcome difficulties and successfully introduce their movies to the world. Participating film critic Mohammad Attebbai said it took Iran five years just to be able to enter its works into international film festivals. According to him, there are two types of films in their domestic industry: Government-funded and independent films. Most young filmmakers are wanting to produce projects independently and are working to tackle financial difficulties and make further creative works. Film director Kazem Mollaie said some of the tight regulations have hindered the development of the cinema industry in Iran, but local filmmakers and artists have been determined in pursuing their creative endeavours to form well-renowned, high-quality works. The fifth HANIFF, themed “Cinema: Integration and Sustainable Development”, featured 147 outstanding films from nearly 50 countries and territories, including more than 40 Vietnamese films. Many of them have never been screened at other Asian film festivals. Participating Iranian films consist of The Home, Kupal, The Salesman, Reza, Taste of Cherry, A Special Day, The White Balloon, and Invasion. The festival lasted through until October 31.